Rahul Gandhi has left nothing to chance in projecting himself as a pro-farmer messiah to reverse the sagging fortunes of Congress party, but a ‘fertilizer scam’ in Rajasthan, which features brother of Ashok Gehlot – the former Chief Minister of Rajasthan who was appointed in-charge of Gujarat Congress in April this year – could ruin the ambitious plans thrashed out by his spin masters. It has emerged that Agrasain Gehlot, the brother of Ashok Gehlot was allegedly involved in a corruption scandal between 2007 and 2009 that involved diversion of a crucial ingredient used for making fertilizers – all of which were actually meant for farmers in distress. Essentially, government concessions available to pass benefits to the farmers were allegedly misused to create benefits for oneself and private companies. According to documents available, this scam largely took place when Ashok Gehlot was leading the state government in Rajasthan and Manmohan Singh was leading the central government at Delhi. It is alleged that Agrasain Gehlot, during the period 2007 to 2009, was part of a conspiracy to export tonnes of Muriate of Potash (MOP) against shipping bills by falsely declaring it mostly as Feldspar Powder or industrial salt; the total value was also falsely declared against the then correct actual value. This resulted in diversion of items that were actually meant for the farmers. The zonal unit at Ahmedabad of the Directorate of Revenue discovered that a firm was exporting MOP, which is a restricted commodity for exports, under the guise of feldspar powder or industrial salt to buyers in Malaysia and Taiwan. MOP, also known as or Potassium Chloride, is a soil nutrient used in manufacture of non-urea fertilizers. There are no viable sources of MOP in India. Since India does not produce MOP, its demand is met by imports and the government provides subsidy on imports. Indian Potash Limited (IPL) is the company that imports bulk of MOP catering to domestic demand. The demand, however, always tends to exceed the availability. The soil nutrient is meant for domestic consumption by the farmers and its export is subject to severe restriction including prior permission of Department of Fertilizers and forfeiture of the custom duty exemptions. A standard sack of imported MOP, which clearly shows that it has to be sold only to farmers and that it is subsidized. It is alleged that this packing was changed to hide the identity of the content, and MOP was illicitly exported by some firms. Concessions and subsidies are granted on import of MOP so that fertilizers are available at low cost to the farmers. The dealers of IPL are mandated to sell MOP only to farmers. However, instead of selling them to farmers who can use it judiciously, some firms were found indulged in exporting them to foreign customers and making profits. After investigating some firms and their activities, the Commissioner of Customs, Kandla concluded that the firms and the associated people were willingly involved in a syndicate that caused losses to the government exchequer in range of crores of rupees, and to the farmers by virtue of unauthorized sale of MOP. The order by Commissioner of Customs, which is with OpIndia, bares the modus operandi employed by the firms and its associates, which involved manipulations and forgery to camouflage their chain of operations and quantum of business. The order goes onto further state that the syndicate clearly knew what they were doing, and that the sales documents were manipulated to show that the MOP was sold to farmers while it was never sold to them. A part of order by the commissioner of collector, Kandla. Anupam Krishi is the firm owned by Agrasain Gehlot. This part highlights one of the wrongdoings employed in the scam. The Commissioner of Customs records statement by a person named Dineshchandra Agarwal, who founded the firm that exported the MOP in violation of rules. Agarwal accepted in his statement that he got involved in the whole syndicate as his financial condition was not good. He was paid a monthly remuneration for opening a firm and obtaining an Import Export Code. 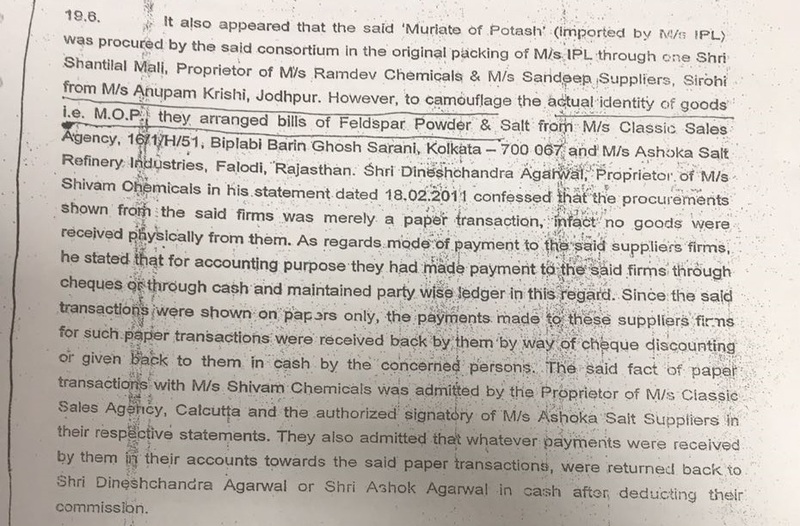 Agarwal also admitted that the syndicate used fake bills to show having bought feldspar powder or salt, which was then used to wrongly label MOP as feldspar power or salt and export it. Firms supplying such fake bills (bills generated without any actual physical sales) were given commission in return. The syndicate used to change the original packaging of Indian Potash Limited to camouflage it as feldspar powder or salt, and export it. 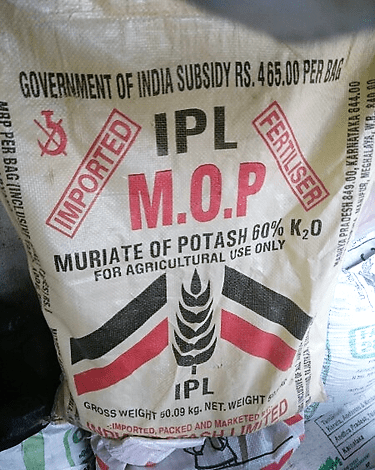 Agrasain Gehlot, a dealer for Indian Potash Limited (IPL), was given MOP by IPL to sell it to farmers, but he sold it to people who subsequently exported it. Agrasain Gehlot was made all payments in cash, account of which was not proper in the books. The person acting as the middleman in this whole syndicate was known to Agrasain Gehlot. 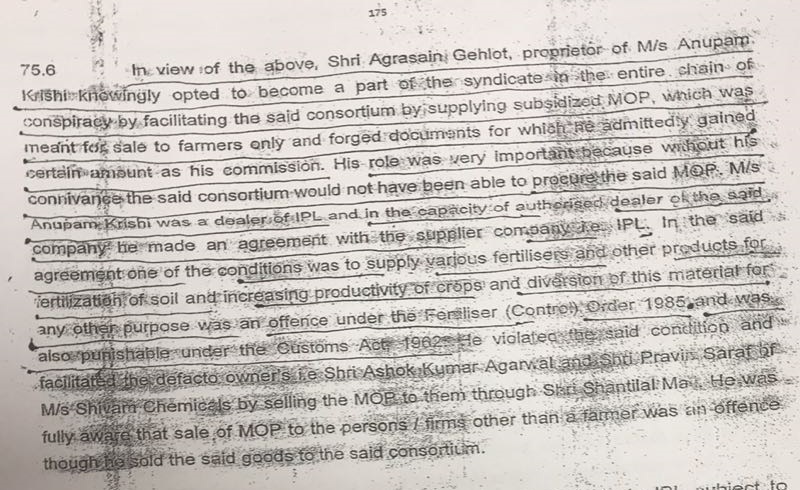 Agrasain Gehlot was the custodian of subsidised imported MOP and he knew that it was an offence to sell it to anyone other than farmers, but he manipulated sales document of his firm to show that MOP was being sold to farmers while in reality it was being subsequently exported. Agrasain Gehlot rejected these charges, and his version is recorded in the order by commissioner of customs. He instead claimed that the middleman used to buy from him in name of farmers and he did not know that MOP was subsequently being exported. He claimed to have not sold MOP directly to the middleman, whom he also accused of possibly having ‘lifted’ the MOP from the ‘buffer godown’ of IPL, entire stock of whose was being handled by Agarsain Gehlot. However, the commissioner order concludes that Agrasain Gehlot was giving contradictory statements and that he has a habit of suppressing facts thereby misleading investigations. The order goes on to state that Gehlot connived with other persons and knowingly indulged himself in diversion of the MOP, playing a very vital role in the fraudulent activities. In fact, the order even claims that Gehlot accepted that he gained certain commission for his role. Observations by Commissioner of Customs, Kandla about statements given by Agrasain Gehlot. The order of Commissioner of Customs was based on the Customs Act, 1962, and it imposed penalties on various firms under Section 114.1 of the Act, which provisions for penalty for attempt to export goods improperly, and under Section 114AA, which provisions for penalty for use of false and incorrect material. With various firms charged with aiding and abetting diversion or illegal transportation of MOP imported at concessional rate of duty in the guise of Feldspar Powder, the customs order imposed a penalty of Rupees 5.45 crores specifically on Gehlot’s firm “Anupam Krishi” for being part of the fraud. Customs commissioner found Agrsain Gehlot complicit and imposed a penalty. Others involved too had similar amounts imposed on them as penalty for their deeds. The parties moved to the West Zonal bench of Customs, Excise And Service Tax Appellate Tribunal at Ahmedabad challenging the commissioner order and sought a stay order, especially seeking waiver of the pre-deposit of the amounts as penalties imposed by the adjudicating authority. The tribunal refused to grant complete waiver but reduced the amount for pre-deposit via an order in August 2014, though the overall matter is currently pending in the tribunal. While Agrasain Gehlot and others have challenged the customs commissioner’s order imposing penalties, a close perusal of the seriousness of the allegations in the order suggests that the activities could as well attract application of Section 132, which provisions for imprisonment for false declaration, false documents, etc. or Section 135, which provisions for imprisonment for evasion of duty or prohibitions. In fact, even Prevention of Money Laundering Act, 2002 could also have been applied, which has even stricter punishments. Money laundering charges are more serious and provision even for imprisonment. One can only speculate the reasons for not invoking harsher sections or acts; whether it was due to involvement of brother of a Chief Minister, or if the commissioner had some other information that is not publicly available. OpIndia.com reached out to Agrasain Gehlot for a response, and he confirmed that the said matter was pending in the appellate tribunal. He denied all the charges and claimed that the retail sales by his firm formed a small part of his overall business, for which he has been unfairly accused of wrongdoing. He further said that he is actually suffering because of being relative of Ashok Gehlot and that the probe findings against him were politically motivated. This is not the first time a relative of Ashok Gehlot is in spotlight. Ashok Gehlot has earlier been accused of favouritism and giving benefits to his family members, including Agrasain Gehlot. In March 2013, media reports claimed that Ashok Gehlot had admitted that Agrasain Gehlot was one of the beneficiaries of allotment of sandstone mines near Jodhpur. It was alleged that allotment norms were changed to benefit Chief Minister’s relatives. Congress has been raising farmer issues in various parts of the country, and people associated with the party were suspected to be instigating violence in areas like Mandsaur in Madhya Pradesh earlier this year in name of farmer protests. Earlier in the run up to Uttar Pradesh assembly elections, Rahul Gandhi had organized “Khat Sabhas” in order to attract support of farmers. The Congress Vice President, rather ridiculously, even claimed credit when BJP government in Maharashtra and Uttar Pradesh announced farm loan waivers. The same rhetoric is now being employed in Gujarat assembly elections too. In his “Navsarjan Yatra” in Gujarat, Rahul has repeated his farmer rhetoric many times by spreading lies about how big industrialists get loan waiver but farmers don’t, and made wild charges about other issues concerning farmers such as land acquisition and farmer suicides. However, this incident of farmers being cheated during Congress tenure in Rajasthan could prove to be an embarrassment for the Congress party and its Vice President Rahul Gandhi, especially because party’s General Secretary Ashok Gehlot has been appointed by the party as in-charge of Gujarat. The party could face questions over farmer welfare, when profits were made at farmer’s expense during Congress governments both in the state and at centre. Ashok Gehlot has already come under fire last month from none other than Prime Minister Narendra Modi himself, who recalled that Gehlot, who was then the Chief Minister of Rajasthan, had tried to scuttle Sujalam Sufalam project to supply Narmada water to areas of North Gujarat. Modi said that the project was badly needed to save the farmers of North Gujarat, but Congress had tried to oppose it. A set of farmers from the region had later termed Gehlot “anti-farmer”. 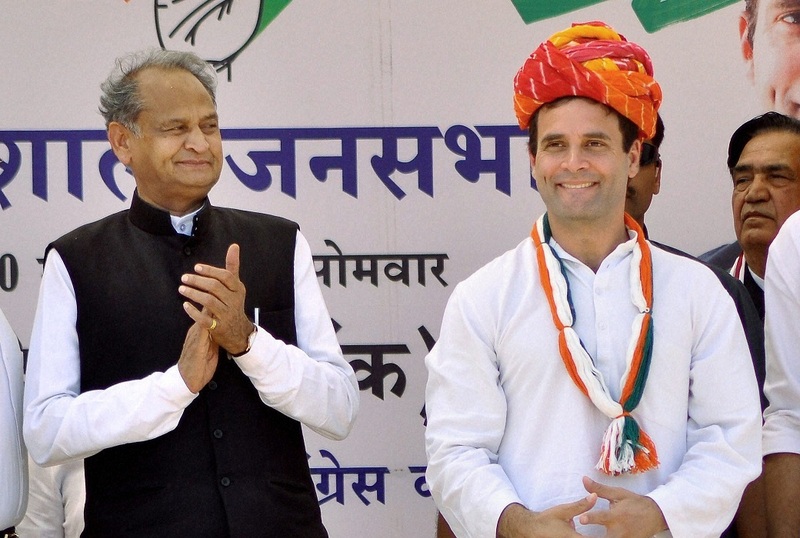 Perhaps the “anti-farmer” jibe can come back to haunt Ashok Gehlot and Rahul Gandhi given the latest findings and election mood in Gujarat.